NEW YORK (CNNfn) - The Federal Trade Commission Thursday approved America Online's proposed $111 billion acquisition of Time Warner after the companies agreed to a series of unprecedented concessions aimed at protecting competition in the high-speed Internet access business. The unanimous nod from the FTC, the nation's competition watchdog, pushed the deal one giant leap closer to its completion. However, it sets up years of FTC monitoring as AOL Time Warner, as the new company will be called, offers "broadband" Internet access over its cable TV lines to more and more customers. CNNfn's Greg Clarkin reports from Washington on AOL-Time Warner merger. With a vote of 5-0, FTC commissioners approved the much-contested deal, which marries AOL (AOL: Research, Estimates), the world's biggest Internet-service provider, with Time Warner �(TWX: Research, Estimates) a media conglomerate with major stakes in the publishing, film, broadcast and cable television markets. Time Warner is the parent company of CNN and CNNfn. The FTC's vote came after an 11th hour-agreement by AOL and Time Warner aimed at safeguarding competition in high-speed Internet access, a key sticking point with opponents of the deal. The agreement between the companies and the government will remain in effect for five years. "In the broad sense, our concern was that the merger of these two powerful companies would deny to competitors access to this amazing new broadband technology," said Robert Pitofsky, chairman of the FTC, in a statement. Click here to read a copy of the FTC statement. Shares of America Online rose after the approval was announced, and closed at $50.00, up $1.65, after trading as low as $47.92 earlier on Thursday. Time Warner shares also closed higher, rising $1.90 to $74.50. With this agreement, the FTC in effect sketched a blueprint by which other agreements involving high-speed access may be judged, even though less than five percent of U.S. consumers have broadband links to the Internet. Under terms of the agreement, AOL Time Warner must offer its subscribers the option to sign up to at least one nonaffiliated cable, high-speed Internet service provider via Time Warner's cable system before AOL itself begins offering such service. It must then offer two other service provider options shortly after AOL launches its offering. "The commission reserves the right to approve the second and third ISP -- we don't want any weak sisters," Pitofsky told a press conference, adding that the FTC can appoint a monitor to keep tabs on AOL Time Warner's actions. 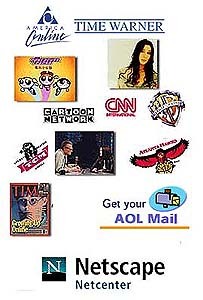 In addition, AOL Time Warner must not interfere with content passed along the networks it has contracted to other ISPs. Analysts were somewhat surprised by the heft of the FTC terms, but saw them as the price paid for blazing this new trail where advanced technology and distribution meet. "This is the precedent," said SG Cowen media analyst Ed Hatch. "This will probably be the template that other cable operators keep their eye on." Henry Blodget, Internet sector analyst with Merrill Lynch, said that he had expected the company to pursue almost all of these practices on its own, and that most will have no significant affect on its strategy or financial performance. Blodget said AOL intended to open access to Time Warner's cable lines in any case, so the concessions won't adversely affect the merger. Moreover, analysts argue that AOL is a master at wooing new customers, and that in five years the market will likely still be ripe for growth, and, no doubt, higher prices. "In the end, forced access amounts to corporate welfare and consumers will be the losers," said ACT president Jonathan Zuck. He added that "forced" access would delay and discourage investment in cable broadband upgrades. In the months since the deal was announced, questions about so-called "open access" were constant from such major rivals as Microsoft �(MSFT: Research, Estimates)� and Walt Disney (DIS: Research, Estimates), as well as consumer groups. They argued the new company would dominate the Internet and limit consumer choice. In a statement, Disney on Thursday said it was pleased with the conditions set by the FTC. "The unprecedented open access and non-discrimination conditions imposed by the FTC today represent a huge victory for consumers and for competition," the company said. "With these safeguards in place, we congratulate AOL and Time Warner on their merger and wish them well. We look forward to working with the newly combined company in all areas, including the development of new media." In November, Time Warner agreed to permit EarthLink (ELNK: Research, Estimates), the No. 2 U.S. Internet service provider, to have access to its high-speed cable lines. The company also has an agreement in principle with Juno Online Services Inc. (JWEB: Research, Estimates). Frederick Moran, head of Internet media and communications research at Jefferies & Co., said that Microsoft's criticism was born of its attempts to make sure that it would not be left out of the high-speed-access equation. After the FTC approval, Microsoft said that the deal would enrich an already competitive technological landscape. "America Online, Time Warner, Sun, Oracle, IBM and other companies all have competing visions of the future of technology," the company told CNNfn.com. "Microsoft looks forward to continued competition in that marketplace." The merger still faces scrutiny by the Federal Communications Commission, but experts predict that is a much lower hurdle for the companies to overcome. Among the issues the FCC is likely to consider is whether AOL Time Warner will open its popular Instant Messaging system -- which allows PC users to send pop-up messages to friends over the Internet -- to rivals such as Microsoft. "AOL, in theory, has open-access to the instant messaging service today, but just under terms that they dictate," said Scott Reamer, Internet analyst with SG Cowen. "Perhaps the FCC will engender AOL to create terms that are more amenable to competitors, accessing the instant messaging system." "It's difficult to know what the real endgame is here because frankly, there's no real market for that today," he added. "It's a free service. The FTC or the FCC in this case, thinks there's potentially a near monopoly there, but it's a near monopoly on a business that hasn't yet proven itself." FCC spokesman Michelle Russo told CNN that the FCC is currently reviewing the FTC decision, and upon completion of the review Chairman William Kennard intends to act quickly. In a statement, Time Warner and AOL said they hope to complete the merger by the end of this year or early in 2001. "This agreement advances the commitment the companies made last winter to offer consumers a choice among multiple ISPs on AOL Time Warner cable systems," the companies said. "The companies expect that their commitment to consumer choice embodied in the FTC agreement will become a model for other cable systems throughout the country." "[The deal] will go to the FCC and we hope that it will close by the end of the year or early next year,"� Merrill's Blodget told CNNfn on Thursday. When the deal was announced in January, it was worth $164 billion, excluding debt and options. With AOL �(AOL: Research, Estimates) shares closing Thursday at $50, the deal is now valued at about $113 billion. Include debt and options and the value swells to about $130 billion. At one point this year, the deal's value fell as low as $88.1 billion, a full 47 percent below its initial value. AOL's stock has risen more than 20 percent since the beginning of the month on heightened expectations that the FTC would approve the deal. This final leg comes after months of push and pull in boardrooms, congressional chambers and in the press, as critics charged that the new company would reduce customer choice. The company countered that limits should not be set on its groundbreaking deal. 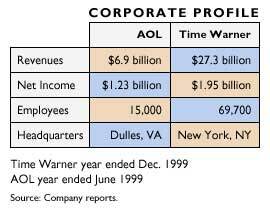 Indeed, critics had complained that AOL-Time Warner would also have an unfair edge in nascent markets such as music distributed over the Web, and instant messaging services. As a result, Time Warner in November dropped a proposed venture with London's EMI Group PLC (EMI), one of the five leading music companies in the world, quelling the concerns of European Union regulators over the music-related implications of the AOL deal.